F&V Bi-Colour 2 X 1 LED Panel Hire from just £100/Day. 2 Lights are included in the package and come in a rollable case. Making use of the highly accurate F&V UltraColor LED, the Z1200 series has an extremely accurate and reliable colour temperature and has a CRI (Colour Rendering Index) of 95. In fact, each LED is guaranteed by F&V to be accurate to +/-100K variation or less in colour temperature, and have no more than +/-1.0 variation in CRI. Having a 60-degree beam angle, the 1200 LEDs also produce an extremely bright light source that makes the output from a single Z1200 panel the equivalent of having three K4000 or Z400 panels. The panels are also supplied each with a Milk Diffusion Filter for even softer lighting, and it attaches via a snap-on quick-release system. 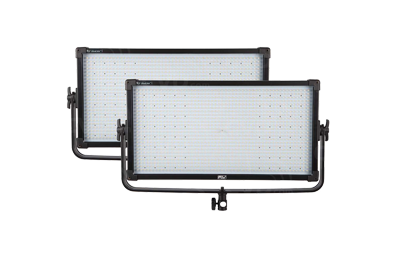 This system allows stacking of light modifiers and even inverted or tilted mounting of the panel without the risk of accessories sliding free. The Z1200 panel is equipped with an expansion port to allow installation of the SmartSync Control Circuit (SCC), in addition to the DMX512 module which allows dimming with standard DMX512 dimmer boards. With the SCC you can daisy-chain panels together using CAT5 cables, and they will operate as one collective unit.